In landbot you can to join the conversation as a human, performing a takeover and increasing the likability of converting your visitors. You need a Premium account to jump into conversations as a human. At any time, you can stop chatbot's conversation and take over as a human to start talking to the Lead, one to one. You can just assign the conversation to yourself by clicking on the Unassigned button over the visitor's avatar or sending a message using the textbox (this will stop the chatbot and assign the conversation to you, too). You can also enter an Assign to an agent block at any time of the flow and the system will automatically look for an available agent to continue the conversation. 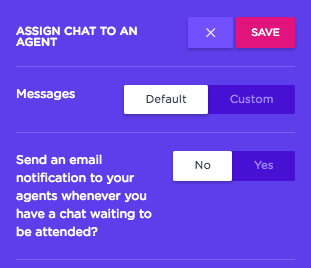 If you click Custom you can take the human takeover to the next level and customize the flow of messages to make sure that, whether there are agents available or not, you're a step closer to conversion! Ask the user the topic to speak agent. When reaching the Assign to an agent block, landbot will send this message to the visitors. Companies usually ask for more information while they look for an available agent. You can also set expectations and tell your average response time. Ask for the user email in case there are no agents online. In case there are no agents online and in order to be able to reach back the visitor, the system will launch this message automatically. Something like "Just in case you get disconnected, could you share your email?" usually works! This email will be displayed whether there are agents connected or not, so it's a great excuse to get that piece of data! While the bot is assigning the chat. A wildcard to ask for more information, thank the visitor for the one already provided or tell a joke to make the wait shorter! There are no agents online. It can happen, so prepare a message for your visitors in case there are no agents online. Try something like " Oops, there isn't anybody here, will reach you out at @email as soon as we're back!". Bot options when there are no agents available. 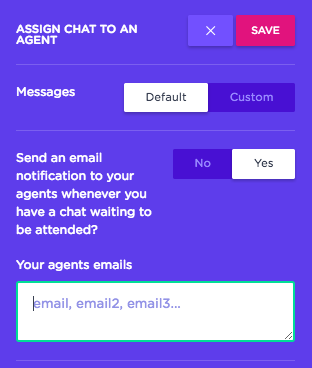 After the previous message - remember, when there are no agents available - the chatbot will give visitors the opportunity to start the flow over again or finish the conversation. You can customize the text of both the message and the buttons that visitors will need to click to start over ( Start chatbot again by default) or finish the conversation (End conversation by default). How do I know when should I take over the conversation? The answer is that it really depends on your specific flow. If you're only picking emails from your visitors, it wouldn't make much sense joining the conversation. If you're qualifying leads with several questions, you may want to personally talk to the best fits. Tip: You can set email notifications to your agents using the same block.